Split can be reached by The Adriatic Coastal Road, winding by the sea or by hinterland roads connected to Split. It will take you 5 hours to get from Zagreb and 4 hours to get from Dubrovnik in your car. You can also reach Split if you get on a coast ferry liner from Rijeka or Dubrovnik, from all central Dalmatian islands. There are excellent fast and regular ferry lines from Ancona and Pescara, Italy. From the Airport Split flights connect the city with Zagreb several times a day, as well as with European capitals. There are also trains from Split to the north of the country and further on to Europe. You can transport your car by train, as well. The largest town on the Adriatic coast, Split, located on the warmest area of the northern Mediterranean coast, not just urban, cultural and traffic center of Dalmatia with road and rail links with a number of Dalmatian resorts, but is itself often a tourist destination for tourists. 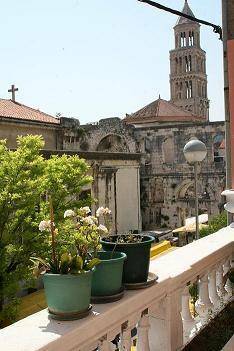 City with 1700 years old tradition, with a series of archaeological, historical and cultural monuments, including the famous Diocletian's Palace and the Mausoleum, statue of Gregory of Nin and the cathedral and bell tower of St. Duje, Split justifies its position as the city of UNESCO world cultural heritage. Its mild climate, with 2700 sunny hours per year, converts it into an oasis where you can enjoy the sun even in winter. Split has a variety of restaurants offering local specialties. There are many beaches and swimming areas in the city and its surroundings, of which the most popular Bacvice, sandy beach almost in the center of town. Cultural and entertainment offer of Split is extremely rich, especially in summer, when the city squares, courtyards and other spaces into large open-air stage. 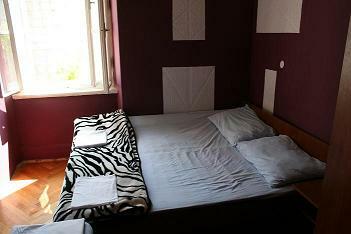 Hostel Ana provides a common area and kitchen that is available for use by all guests. There is also a terrace that is open for guests to enjoy. Internet access is provided free for all guests to use. 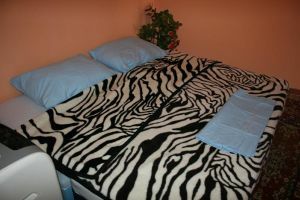 There are four rooms with a shared bathroom (both a mens' and a womens' room) as well as a dormitory style room that can host up to four guests. Three rooms have their own bathrooms. 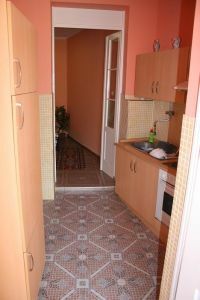 In addition, there is an apartment that can be rented. 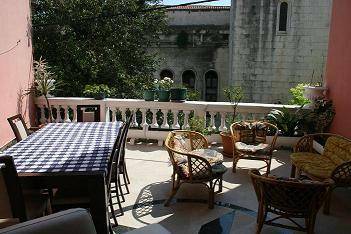 Right outside the old city walls, Hostel Ana is the perfect location to see what remains of Diocletian's Palace. 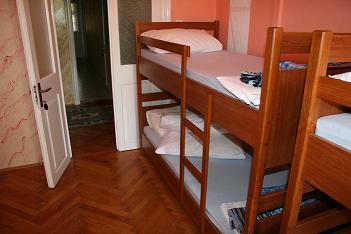 Hostel Ana is also quite close to the area's beaches, which can be reached after a walk of about 10 minutes. In the historic center there are many museums that can be visited as well as a large sea-front that is populated by locals every evening. There is no penalty for a cancellation, and no deposit is required. Payment is only accepted in cash. From the ferry port or bus station follow Obala kneza Domogoja towards the center of the city until you come to Polijana kneza Take a left and follow the street until your next right, which is Hrvojeva. Follow Hrovojeva, which follows the old palace wall, until you pass an old city gate on your left and the street Stari Pazar on your right. Almost immediately, take a right down a small alley, and you will see us. Note: you will have to park your vehicle before you walk the last little bit. Parking is available outside the historic city center. It should be quite apparent. Airport pickup can be arranged as well should you desire. We are quite close to the bus station as well as the port. There is also a very good taxi service that can be arranged.